Sir Ian Carruthers OBE will be installed as the new Chancellor of the University of the West of England on Monday 18 July and will confer his inaugural awards ceremony for graduands of the Faculty of Health and Life Sciences at Bristol Cathedral. Graduands and guests at the Cathedral will enjoy the tradition of the installation ceremony which begins with the Chancellor's procession of senior University staff and local dignitaries including The Dean of Bristol: The Very Revd Dr David Hoyle, The Rt Hon Lord Mayor of Bristol: Cllr Geoff Gollop and HM Lord-Lieutenant of Bristol: Mary Prior MBE JP. Sir Ian's first act as Chancellor will be to confer the awards and prizes of students graduating from the Faculty of Health and Life Sciences. He will also award the honorary degree of Doctor of Business Administrationto Stephen Golledge in recognition of his significant contribution to the development of UWE's health provision and continuing input to the National Health Service. Vice-Chancellor, Professor Steve West will formally invite Sir Ian Carruthers to become the new Chancellor, symbolised by the traditional gesture of clasping hands. He said, “Award ceremonies are always a wonderful occasion for the University to celebrate the well-deserved achievements of our students. This year, will be even more memorable for the graduating Health and Life Sciences students to have their degrees conferred by our newly installed Chancellor, who has played such a vital role in the NHS over the past 40 years. Sir Ian Carruthers OBE brings a wealth of experience to his new role for the University. 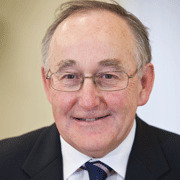 He is currently Chief Executive of the South West Strategic Health Authority. His career in the NHS spans over 40 years. He received a Knighthood in the 2003 New Year's Honours List for services to the NHS and in 2006 he took over as Interim Chief Executive of the NHS, amongst the largest organisations in the world, having 1.3 million employees and a budget in excess of £100 billion. He has been the lead author on several papers on reviewing and improving the NHS and is seen as an international expert on healthcare systems and service delivery. UWE awarded Sir Ian the Honorary Degree of Doctor of Science in 2009 in recognition of his outstanding contribution to health and wellbeing in the South West. In his NHS career Sir Ian has transformed access to healthcare as well as the quality of services and financial performance in both national and local settings. He has overseen many major service changes and is a champion of change to deliver better outcomes for patients, staff and communities. He believes strongly in partnership working and this is demonstrated through the improvements that have seen the NHS in the South West achieve healthcare that is amongst the best in the United Kingdom. Sir Ian has undertaken a range of national tasks which most recently has included a review of service reconfiguration and co-authoring a report on age discrimination in health and social care. He is currently undertaking a review on behalf of the NHS Chief Executive of innovation in the NHS as part of the government's 'Plan for Growth' published in March 2011. The previous Chancellor since 1993, The Right Honourable the Baroness Butler-Sloss GBE PC has provided outstanding service to the University as an ambassador and advocate and will continue as Chancellor Emerita.